Wiring the MCP9808 to a Raspberry Pi or BeagleBone Black is easy because the board only uses an I2C bus for communication. Connect the MCP9808 to a Raspberry Pi as follows. Note that you must have I2C enabled on your Raspberry Pi. Connect Pi GND to MCP9808 Gnd. Connect Pi 3.3V to MCP9808 Vdd. Connect Pi SCL to MCP9808 SCL. Connect Pi SDA to MCP9808 SDA. Connect the MCP9808 to a BeagleBone Black as follows. If you aren't familiar with how GPIO pins are numbered, check out this guide on BeagleBone Black GPIO. Connect BeagleBone Black P9_1 DGND to MCP9808 Gnd. Connect BeagleBone Black P9_3 3.3V to MCP9808 Vdd. 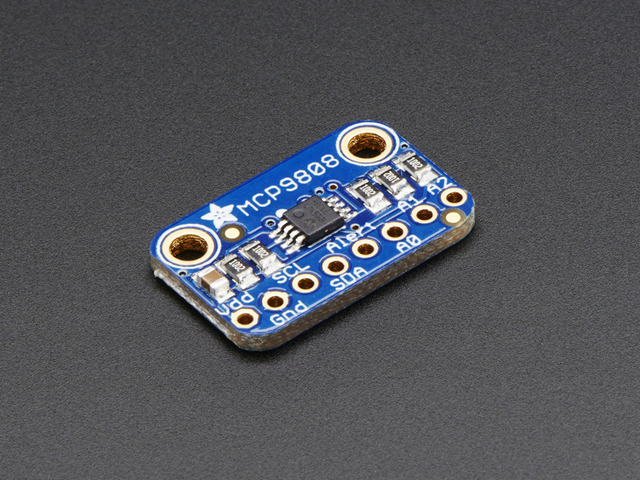 Connect BeagleBone Black P9_19 I2C SCL to MCP9808 SCL. Connect BeagleBone Black P9_20 I2C SDA to MCP9808 SDA.